Oh boy, was I excited to read Darkness Falls by Cate Tiernan! When I read the first book in the series, Immortal Beloved, I fell in love hard. With the story and the characters and the detail and how much layering was done with the different strands of the story. 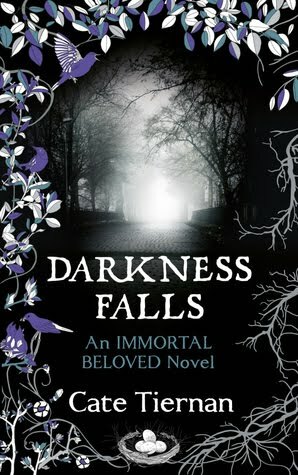 I had very high expectations for Darkness Falls and I was not disappointed! Darkness Falls is everything I loved about Immortal Beloved and more. More of Nastasya and Reyn, more history, more character development, more action and just more fun. I really love this series, it was such an addictive read! Darkness Falls takes place not long after the events of Immortal Beloved. Nastasya is still attempting to make peace with who she is and the actions that have led her to where she is. She's an immortal being who has lived the past hundreds of years with no care or concern for the humanity that surrounds her and she's really beating herself up about her behaviour. But with the help of others at this sort-of rehab place for immortals, Nastasya is attempting to be a better person, to make amends and to shed the darkness that she feels lives within her. And despite her vow to try to connect more with the people around her, she's still reluctant to get any closer to Viking hottie, Reyn, who was responsible for wiping out her entire family. When I started this series, I was really just expecting to find an interesting and emotional romantic story, and instead I found so much more. I was absolutely fascinated to read more of Nastasya's memories of her life through the decades. They are memories that pain her now, as she reconsiders how little regard she has had for other people throughout the years. It's sometimes a struggle to read of Nastasya's regret and also of how little she believes in her ability to change and make amends for the darkness, but it just made me feel so much more for Nastasya as a character. She's tough and snarky, but still so vulnerable and lacking in self-belief. So I could fully understand how that doubt causes her to make the choices she does in this book. From the first book, I really wanted to know more about Nastasya and Incy, and Cate Tiernan definitely delivered on this part. I thought their relationship was wonderful delivered to us as readers. There's some really creepy and dark undertones as Nasty feels uneasy about the concept of Incy finding her in River's Edge having run away from him. We get to see how the two first met and a lot of their history together. I loved getting to know his character and this history more. I just want more of this series as soon as possible! I want to know more about Nastasya. I want more of Reyn. I want to know more about Nastasya's past and her experiences, more Incy! Just more of everything. I don't think i have seen or heard of this series before, but you've definitely got me intrigued now! I really liked this one! It took me a while to warm to Nasty in the first book, but I'm really into her whole story now! I wasn't all that keen on the first one, though I'm curious to see if I like this one any better! Leanna - I've heard people say that, but apart from the unfortunate nickname 'Nasty' which makes me cringe, I loved her right from the first page. :) Glad you came around to her..
Vicki - Yeah, definitely give it a shot! Depending of course, on what you didn't like about the first one though, I'm not sure. Good luck!